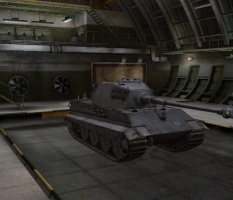 The E 75 is a German tier 9 heavy tank. 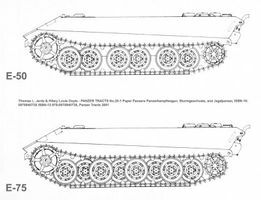 The first heavy tank in the Entwicklung series, this tank has thick frontal armor that comes with excellent sloping at the front. 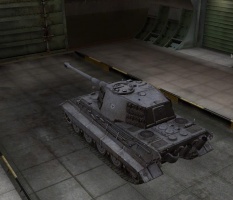 Stock, it is armed with the inadequate 8.8 cm KwK 43 L/71, but can also use the 10.5 cm KwK 46 L/68 from the Tiger II, so make sure to research it before using the E-75, unless you want a terrible grind. Eventually, you will have access to the very powerful 12.8 cm KwK 44 L/55 that packs a sizable punch up close or afar, albeit being relatively unreliable at range (in contrast to earlier tanks). As such, owing to the great armor and devastating weaponry, it is an excellent brawler, perhaps the perfect definition of one for Tier 9. 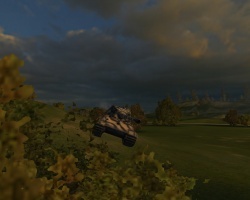 The E-75 has sluggish acceleration, making it difficult to move around. While the E-75 is one of the easier tanks to flank, it is still harder to damage once flanked thanks to its relatively thick side armor. Speed and agility aside, it is a versatile tank. You can be a close range brawler relying on your brutish armor and firepower to keep you alive, but due to the poor vision, merely average penetration, poor gun handling, and low DPM, sniping like previous tanks is unadvisable. The E-75 is one of the most dynamic heavies of its tier, with thick hull and turret armor coupled with an excellent gun. In situations in which your armor does not hold out against enemy fire, you have enough hitpoints to last while you're under fire. The E 75 leads to the E 100. Strong overall armor with few weak spots. Proper angling/sidescraping very effective. Reasonable gun depression and high penetration premium APCR round. Lower damage per minute than many tier 9 tanks; will lose straight-up DPM wars. Front-mounted transmission can damage the engine with frontal hits to lower hull. Poor armor on stock turret. From there the turret is a great next step, as you need it for the gun. If the top radio is not yet researched, research that and put it on. Contrary to the in-game description, no blueprints of the E-75 exists. 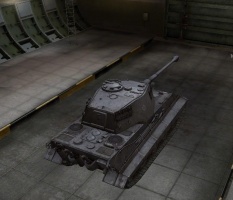 The E-75 was an incomplete project, of which no historical records of its armour or design specifications exist. Its only intended turret and armament are the Tiger II Serienturm and 8,8 cm Kw.K. 43 L/71 respectively. 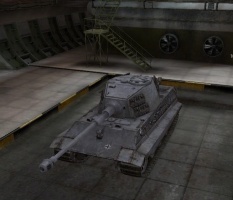 The 10,5 cm gun was developed only for the Tiger II, not the E-75. This page was last modified on 18 July 2018, at 16:57.